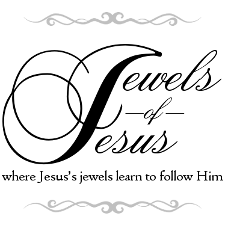 Four and a half years ago, Jewels of Jesus went live in the blogging world. It started with Esther and Tiffany. Later, I joined the team. Eventually new writers joined, and left, and now only I remain. I have been so blessed to be a part of this ministry with all of you. You have been the motivation and passion that has kept JOJ going for so long. Thank you for your encouragement and partnership in this blog and magazine. I'm writing to let you know that I won't be continuing this blog any longer. With changes in life and commitments on the horizon, the necessary time investment to JOJ just isn't going to be possible. But I just want to tell you how grateful I am for each of you. For your contributions of time, energy, and talent into encouraging one another through this ministry. For your testimonies of the way JOJ has challenged and blessed you. For your desire and commitment to make Jewels of Jesus the ministry it has been. The Lord has been faithful in the little details and in the most far-reaching elements. He has done some amazing things, and He isn't stopping here! With a new year beginning, we have the opportunity to look ahead, and seek God's will for each of our lives. He desires to use us, to work in and through us to accomplish His purposes. So keep shining the light of Jesus. Keep trusting His sustaining grace. Keep walking in the truth of His Word. Keep praying in the power of His Spirit. Keep being Jesus' Jewel. You don't need to lose contact with me, though. :) Feel free to follow my personal writing blog, Compositions for the King. I occasionally post there, when time allows me to. I am sorry to hear you are closing the blog, but I understand! May God richly bless you in this new season of your life. Thank you for the encouragement you have been to so many! We do not participate in any tags, blogger awards, etc. Sorry, but that's just something we don't do. Will YOU Write For Us? Guest Post :: Are you ready for Eternity? Keep up-to-date with the Latest Posts! ©2014 Jewels of Jesus. Content may not be used without express permission. Powered by Blogger.